2008: 5th place, 23 points. 10. Wait – Robert Howard & Kym Mazelle. 4 points. 9. Fine Time – Yazz. 2 points. 8. Last Of The Famous International Playboys – Morrissey. 4 points. 7. You Got It – Roy Orbison. 4 points, most popular. 6. My Prerogative – Bobby Brown. 3 points. 5. Love Train – Holly Johnson. 4 points. 4. The Living Years – Mike & The Mechanics. 3 points. 3. Love Changes Everything – Michael Ball. 1 point. 2. Belfast Child – Simple Minds. 1 point, least popular. 1. Something’s Gotten Hold Of My Heart – Marc Almond featuring Gene Pitney. 3 points. With 1999 safely out of the way, this year’s competition gets a lot closer, with little to separate our remaining four decades. And having watched the Eighties slide ever lower down the rankings in recent years, I nursed high hopes that 1989 would reverse their fortunes. For a while, things were looking promising. Howard/Mazelle, Morrissey, Roy Orbison and Holly Johnson all finished in second place, and 1989 even led the pack at the end of a couple of rounds. But then disaster followed, in the shape of a weak Top Four and two consecutive bottom placings for Michael Ball and Simple Minds. Although Marc Almond and Gene Pitney drew favourable comments from most quarters, a tough draw left them stranded in third place. It was the final nail in 1989’s coffin – and a disappointing placing for a period which I have always held in high regard. Maybe it’s just the distorting lens of nostalgia, but my memories of the 1989 charts are largely fond ones. From the UK pop/soul corner, we had Neneh Cherry, Soul II Soul, Fine Young Cannibals, Rebel MC… and yes, even Lisa Stansfield for a while, back when she still seemed like a good idea. From the US, we had quality house music from Adeva, Chanelle, Ten City, Inner City and Lil Louis, and ground-breaking hip hop from De La Soul. Madonna restored her artistic reputation with Like A Prayer, Bobby Brown and Alyson Williams brought a modern edge to R&B; the Pet Shop Boys collaborated with Dusty and Liza; there was some ace Euro-dance from Technotronic, Capella and the Italo-house brigade (led by Black Box’s “Ride On Time” and Starlight’s “Numero Uno”); “Voodoo Ray” and “Pacific State” put Manchester on the dance map, while the Stone Roses and Happy Mondays ushered in the Madchester/baggy boom… such riches, people! Such riches! 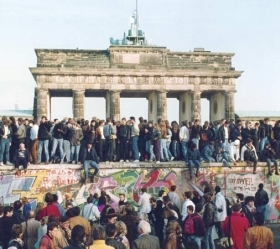 On a global level, 1989 marked a historical turning point, with the collapse of the Iron Curtain and the end of the Cold War. And on a personal level, these were significant times. K started a job which involved extensive international travel, and I was promoted into a role with dramatically increased responsibilities. The travel seemed glamorous and exciting, the promotion felt like an honour… and ignorance was bliss, on both counts. The DJ-ing had gone weekly, the night was doing great, and the social life hadn’t been this busy since student days. If I were ranking these five years in terms of personal happiness, then 1989 would probably come out top. But never mind. Fourth position will have to do.